Super chic clothes for curvy ladies is what this store offers! And when you purchase a discounted Lane Bryant gift card you’ll stretch your dollar than you ever have before! From undergarments and swimwear to shirts, dresses, and shoes- you’ll find everything you need and more! And don’t forget, gift cards make excellent presents too! Get yours today and treat your curvy lady to a shopping spree she’s sure to remember! Not only will your discounted Lane Bryant gift card save you money, but with over 812 stores across North America, you’re sure to have one conveniently located close to you! Get your card today and start saving money on the stylish clothes you love to wear in the sizes you can wear! Don’t let another season go by without updating your wardrobe! You know you deserve it! Have you been dreaming about updating your wardrobe but hate shopping around for those hard to find sizes? If so, then this is the store for you! With sizes ranging from OOX (10-12) to 3XP (26-28), you’re sure to find perfect fitting clothes and in all the newest and greatest styles. Now just think of the money you’ll save when you use your discounted Lane Bryant gift card! Finally, you can let your beauty shine in beautiful clothing at a fraction of the cost! Now, that’s a great deal! 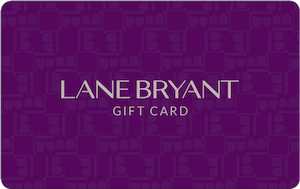 Your discounted Lane Bryant gift card will save you money on your entire purchase. Just think, sweaters, dresses, pants and more, for less money out of your purse! And that’s not all, at Cards2Cash, we know how important it is to have a good time, and that’s why we offer discounted cards for many other retailer shops. From shoe stores to restaurants and everything in between, we save you money! Be sure to check out our listings for Ross, Cato, Dillard’s, Dress Barn, and more! With Cards2Cash on your side, you can be your beautiful self, without breaking your bank account! Sell your unwanted gift card today! Do you have a Lane Bryant gift card you aren’t going to use? Great news! Cards2Cash buys lots of gift cards! Not only do we buy them, but we pay top dollar! If you have a card, you would like to sell just stop in one of our retail locations for payment on the spot, OR simply fill out our online form and we’ll get back to you with an offer! It’s just that easy!